TO BE honest, we didn’t like Mikhail Red’s first movie, “Rekorder” (2013), a film about an alienated film pirate that was not able to fully articulate what it wanted to say. His second work, “Birdshot”, is definitely a much better realized work, even technically. 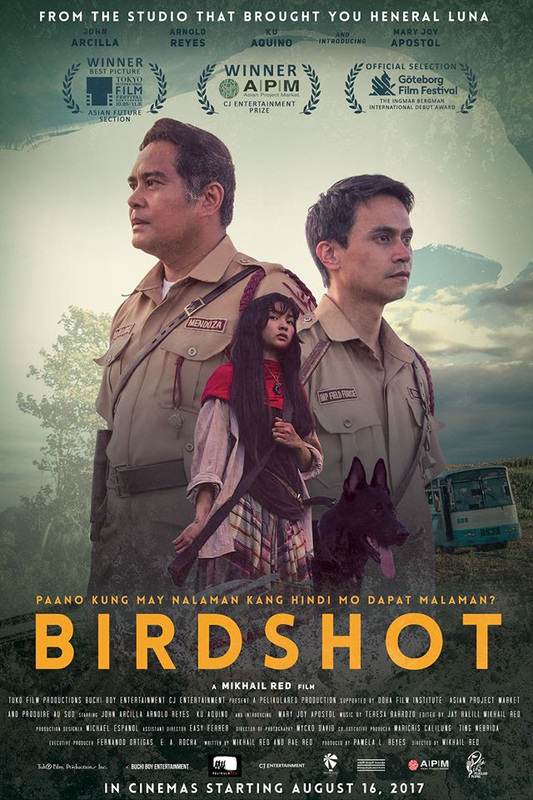 The film starts with a father, Diego (Ku Aquino), teaching his teenage daughter, Maya (Mary Joy Apostol), how to handle a gun and shoot properly. They live in an isolated hut in the middle of cornfields in the mountains and Diego wants Maya to learn how to protect herself in case something happens to him. They live near a sanctuary for the Philippine eagle or haribon, a protected species. Later, Maya takes the gun into the sanctuary and shoots a haribon. Some farmers are supposed to go to Manila to air their complaints and grievances about the hacienda where they live and work. They never get to the city and two small town cops are assigned to search for them, Mendoza (John Arcilla) and Domingo (Arnold Reyes.) Domingo is a neophyte cop and still idealistic, in contrast to the more jaded Mendoza. He lives with his wife (Elora Espano) and their first baby. Domingo is very earnest in his desire to investigate the case of the missing farmers, but their boss (Dido de la Paz, who just won Cinemalaya best supporting actor award for “Respeto”) orders them to forget that case and focus instead on the killing of the eagle. The cynical Mendoza quickly complies, but Domingo continues to be concerned about the missing farmers, until the safety of his family is threatened by some unknown and powerful forces who obviously want a coverup. This angle in the film is apparently derived from the Ampatuan, Maguindanao Massacre in 2009 that still awaits justice up to now. Mikhail Red and his cousin co-writer, Rae Red, then combined this with the news story of a farmer arrested for killing a Philippine eagle which he doesn’t know is an endangered species. Their film implies that, these days, the life of an eagle is much more important than that of oppressed humans whose murder are quickly covered up with impunity through corruption in high places. The film is also a coming of age story for Maya, whose first menstrual period comes in the course of the narrative. The expected violence in the film’s last few minutes involving Maya will no longer shock you because the film is really going to that direction with a series of bloody scenes starting with the brutal beating up of her father after he’s arrested and imprisoned. The film is well served by its lead actors, notably Arnold Reyes as the new cop whose values are quickly eroded after the frightening threats to his family and the disapproving stares he got from his commander and fellow cops. We can see the dilemma and confusion that he is going through with regard to the moral righteousness of what they’re doing. This eventually erupts in an act of ruthless violence against the captive Diego. The film is not talky, so the actors are often required to register their thoughts and feelings through their eyes and facial expressions and not through lines of dialogue. This may be Mary Joy Apostol’s first movie but she manages to hold her own in the company of her more experienced co-actors. She invests her Maya with the right mixture of innocence, vulnerability and ferocity that it requires. Red injects some magic realism into his film as we see Maya seeing mysterious images like the scarecrow we see her carrying at the film's start. It’s as if some spirits of the forests are watching over her as she goes through a very difficult rite of passage. The final scene when we finally discover what happened to the missing farmers will shock you. Reyes and Apostol get splendid support from Arcilla, Aquino and de la Paz. Red has a mastery of film language and technical credits are mostly superb, including the production design, the cinematography showing the lush beauty of nature in earthy tones, the spare but very apt musical score. But at almost two hours, the film can surely stand some trimming to tighten the pacing, get rid of a lot of pauses that are not really pregnant, and hasten some dragging scenes that tend to just go on and on to induce you to slumber.